Unique luxury business gift ideas to help your company be unforgettable. Searching for some perfect executive gifts? Well, look no further. Whether you want to reward your boss, employees, or clients, we have the perfect gifts for executives that have everything. So, what do you get for the executive who has everything? We’re here to give you a little advice and even show you the best-sellers from 2019. No matter if you are looking for executive gifts for him or gifts for female executives, we have you covered. All items are useful and will show the recipient that you care. They will also give you plenty of brand impressions while being used by the executive you give them to. It can be difficult picking the perfect item to give away. Especially when the person you are shopping for has everything. It can be made even more complicated by the fact that you may not really know what they want. Buying gifts for family can be hard enough. Well, that’s why we’re here. With years of experience helping people find the best gifts for executives, we decided to put together a list of the best options for you in 2019. In addition to them being useful, you can turn these into personalized executive gifts which are sure to get you advertising while in use. Not only are watches stylish, but they show the recipient that you care. Regardless of the model or price, watches give the appearance that you spend a lot of money and took the time to actually choose something useful (the number of people who wear watches outnumber those who don’t). Watches that make great gifts for female executives include the women’s chronograph watch or the women’s high tech watch. Executive gifts for him include the Bracelet Styles Men’s Classic Watch or the Sport Style Men’s Watch. We also have a full line of unisex watches or you can browse all watches available through iPromo. Remember that all of our watches can be personalized with your brand name. It is inconspicuous enough that people will still wear it, but they will see your name whenever they check the time. So not only is it a styling gift, it will lead to a number of brand impressions which will result in a good return on investment. Watches make the perfect gifts for executives that have everything because many people have more than one. Adding a new one to their collection will only add to their wardrobe and ensure it gets use. Yes, we said, “wireless.” Everyone is connected nowadays. Whether its mobile phone, tablet, or even smartwatches, everyone needs juice. In fact, running out of charge is a common problem with executives who are always on the go. Getting them a wireless charge would be appreciated as it is something they will always use. No one is more popular in the wireless charge game than mophie. The company offers power stations and juice packs, both of which can give you the charge you need when you’re on the go. As with all our products, you can customize each one with your brand so that people remember who gave it to them. If you really want to impress the recipient, go with the newest Qi technology. This technology allows you to charge your device simply by placing it near or on the charging station. Nothing to plug into the device itself. 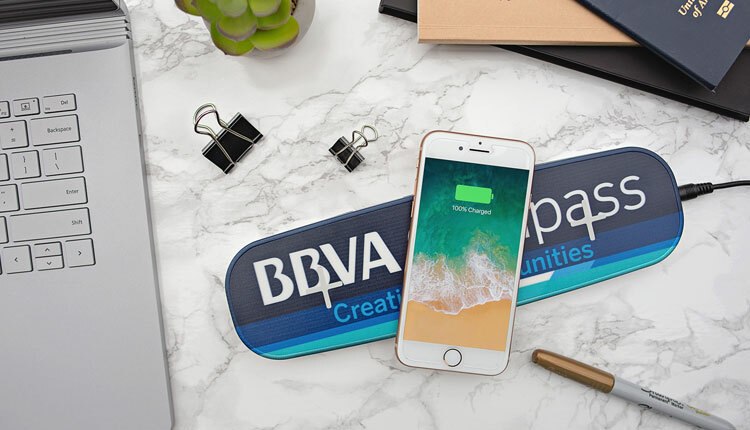 For more information on wireless charging, see our 2019 Guide to Wireless Chargers & Power Banks. Spots related items don’t always make the perfect corporate gift, however, there is always a caveat. Golf is an exemption as many executives play the sport regardless of their profession or age. Many deals are closed on the golf course which is why it is so popular among executives. And, some of the best gifts for golf can come from Titleist. If the person you are buying for is a golfer, then Titleist is the name they know and will appreciate. Personalized golf balls can be a perfect gift. And, Titleist ProV1 are the best golf balls available. They are the most played balls on the PGA Tour and now you can get them customized through iPromo with your logo. If they have a different style ball they plan, you can always go with Titleist Tour Soft or Titleist TruSoft, all of which can be personalized to your brand. If you know they like golf but are unsure if buying a box of golf balls is best, you can always go with some golf swag like a golf hat or even a golf bag. For personalized executive gifts, consider custom Yeti cooler. Yeti is a relatively new company, but it has become a staple for coolers in the United States. So much so they have grown into a publicly traded company that is now the top seller of coolers. Yeti is so popular that it is used by everyone from outdoorsmen to celebrities. If the person you are buying the gift for enjoys outdoors, then a custom Yeti cooler is what you should go with. Keep in mind that since they are stylish, you don’t have to be someone who camps or fishes to enjoy it. Celebrities like Matt Damon own Yeti coolers. People know this, which is why it has become somewhat of a fashion statement. In fact, they are available in many different styles from large hard coolers to softer material hopper and backpack cooers. Remember that all Yeti coolers can be customized with your brand image. As such, you will have a co-brand partner that has already made a name for itself. If you don’t want to go all out and purchase a cooler, we also have customizable Yeti products such as tumblers, mugs, and vacuum bottles. What executive doesn’t have a travel bag? It is also something that you can to someone who has everything as they eventually wear out and need to be replaced. Let the one you give to them replace and old one and get tons of brand impressions for the next year. For executives that carry a lot of paperwork in their jobs (attorneys, real estate professionals, etc. ), try a travel case with wheels. If the same executive has a laptop, get them a compu-case which is similar but also has a spot for a laptop. We also have a full line of briefcases made from various materials, including leather. We have a full line of backpacks that are nothing like what you used at school. Various styles and materials make them fashionable for any executive wardrobe. You can also go smaller if you choose and give the executive a portfolio or padfolio. Regardless of the type of travel bag you use, the recipient is sure to appreciate it. They will use it at work and in their off time to ensure you get plenty of advertising for your brand. As stated above, it can be difficult to find gifts for executive that have everything. Regardless who you are purchasing for, make sure that choose something useful. The recipient will appreciate the thoughtfulness and you will get more brand impressions the more they use it. Be personal and give something they will love. Going with some of the items listed can certainly get you brownie points with whoever you are buying the gift for. Finally, keep in mind this is only a short list of personalized executive gifts that we offer. Give us a call and we can match you and your budget with the right executive gifts for your business.